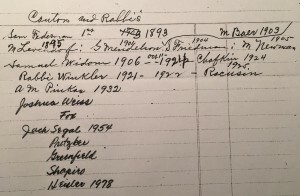 Original list of rabbis from ledger book (Rauh Jewish Archives MSS#107, Box 4, Folder 2, p. 108). There is a duplicate of this list on the spreadsheet of officers in Box 9, Folder 6. My research has uncovered that neither list is quite right. The rest of this post is the full list of rabbis as I’ve been able to reconstruct it using the synagogue’s meeting minutes (1920-1978 with a gap 1951-1963) and payment records, as well as the town’s newspaper and city directories and Pittsburgh’s Jewish newspapers. His daughter married a man in McKeesport not long after the family arrived, and it seems that it where Rabbi Federman went next. In 1907 the Homestead paper noted he performed a Jewish wedding there. His year in the historian’s list is 1895, but he probably did not arrive that early, since the city directory says Federman was the rabbi until at least mid-1896. He is mentioned a few times in newspapers from 1900 and 1901. On 7/24/00 the paper reported he had a son, on 10/22/00 it reported his wife was thrown from a street car, and on 2/21/1901 it recapped a wedding he performed. The 1900 census reported he lived on Eleventh Ave. (as in, nowhere near the Jewish neighborhood) with his wife and four children (two months before the aforementioned son was born), but the city directory lists him as a butcher on Heisel, which matches to the location the newspaper assigns him. Interestingly, for the years he was living in the town, the town’s directory did not list him as the synagogue’s rabbi, only as a butcher. Instead, it listed a man who does not appear in the list at all! After Homestead he served in Greensburg, Monessen, and New Kensington, before leaving the area to be rabbi in Hot Springs, AL by 1935. This man is not in the list, though much documentation attests to his presence. The 1898 and 1900 Homestead city directories named him as the rabbi, though only in 1898 did it list him as a resident of the town, living on Sixth Ave., and he does not appear in the 1900 census. He is mentioned twice in the Homestead newspaper, on 10/19/1898 for having performed a wedding for the youngest of the synagogue’s charter members, and later as the synagogue’s rabbi in a May 1900 supplement trumpeting Homestead’s progress in its first twenty years. The earliest mention of him is at the 8/19/1901 cornerstone laying; shortly thereafter the Homestead paper announced his hiring. His previous congregation was in Punxsutawney. (I couldn’t find him in the 1900 census for that town. A 1/28/1902 Pittsburgh Gazette article gives his full name as Jacob G. Mendelsohn; if so, before Punxsutawney, he was in Titusville.) He is also listed in the 1902 Homestead city directory as the rabbi of the synagogue and living on Dickson St.
From 1902 on, we can assign more precise dates to rabbis based on when they were paid. Payment records for his $25/mo salary start with the beginning of the 1902 volume, though there is an entry “Rev G. Mendelsohn move exp.” on 11/23/1902, over a year after he had started. They paid him through the end of July 1903. There are also entries like “Rev. 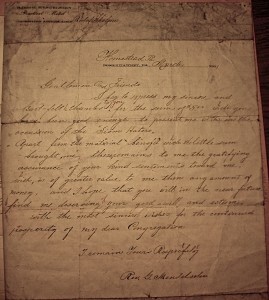 G. Mendelsohn cleaning Syn,” which suggests to me that he was responsible for this part of the synagogue’s operation and reimbursed for the expenses he incurred (presumably in hiring men to do this work). On 8/20/1903, the Homestead newspaper reported that Rev. Mendelsohn was moving on to Nashville (Congregation Adath Israel, wrote the 1904 American Jewish Yearbook). Later he was rabbi in Easton, PA and Patterson, NJ. Next the list has “M. Baer 1903,” but no salary was paid to any other rabbis besides Mendelsohn, then Friedman during this period. This must be a mistake; perhaps the earlier Bierman, who was otherwise omitted from this list, is whom the historian had in mind? 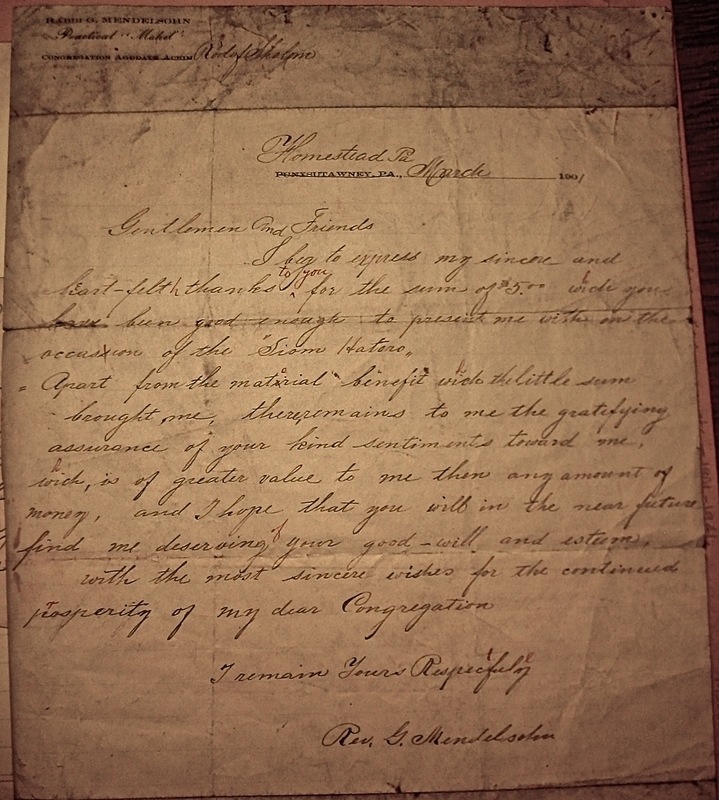 In the same article in which it reported Mendelsohn’s departure, the local newspaper introduced the new rabbi, Rabbi Friedman, “who comes here from Buda-Pest, Austria.” The synagogue’s records confirm he was first paid his $30/month for August 1903. Rev. 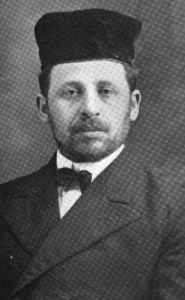 Alexander J. Newman became rabbi in September 1904. He also got $30/mo. They paid his moving expenses on 9/25/1904 (from Titusville, PA? 1 ) and first paid his salary on 10/9/1904 for the month of September. They knew by May 1906 he would not be continuing, as that was when they first paid for an advertisement to find a replacement. He was last paid for the month of June (though I would have thought he had one more month left on his contract). He is also listed in the 1906-7 Homestead city directory as the rabbi. Though Widom started August 1906, the Homestead newspaper reported that Newman led the High Holiday services in 1906 (although there is nothing in their financial records to support this). In April 1907 the Homestead newspaper mentioned that he was superintendent of the Hebrew Home for the Aged in Pittsburgh. We know he started in August 1906 from the payment records. He received $33/mo to start ($37 during the high holiday months), then $42/mo beginning September 1909, $50 Oct or Nov 1911, $75 March 1914, then $50 July 1914. He often received presents around high holidays. He was first listed in the 1908-9 Homestead city directory (not the 1906-7). There was a Rabbi Louis Jacobs listed in the 1908-9 city directory as co-rabbi of the synagogue with Widom! Is this related to the break-away Congregation B’nai Jacob? He first shows up in the payment records as a teacher who started 6/21/1907. At this time Widom was getting $33/mo where Jacobs was getting $30 every two weeks in his initial months, though it appears to have dropped to $30/mo by the end of the year. They start referring to him as “Rev” in mid-September. He got $25 for a speech in October 1907. The last listing for his entries is through 12/1/1907. Then he re-appears in April 1908, getting a delinquent $30 covering the last two weeks of Sep. 1907, then $40 for the first two weeks of April 1908… and then that’s it, the last time HHCRS pays him. And yet he is listed as a co-rabbi. Hmmm. Another rabbi who doesn’t show up in the list is Rev. 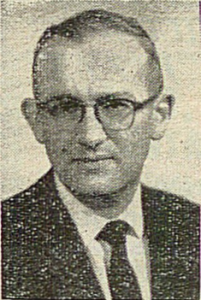 Dr. A. Kahn. He doesn’t appear in the shul‘s financial records, either. And yet, the Homestead paper refers to him more often than any other rabbi ’til now. He “auditioned” on July 8, 1916, and on August 4 “arrived here to accept a position as cantor…He comes well recommended and will teach the Jewish children and instruct the adults in general topics.” He was a rabbi and had some sort of secular degree from a Berlin university (typesetting error leaves the matter vague). He published long sermons in Homestead’s paper about the High Holidays and Pesach. He gave Hebrew and English sermons at services, spoke at B’nai B’rith day in November, and directed a Chanukah festival in December. “Since his advent in this community, [he] has established a well earned reputation as a brilliant, forcible and entertaining speaker,” the paper praised him. All of this is to say that Widom never enjoyed such attention. I wonder whether Winkler (below) was actually Homestead’s second attempt at finding a better educated and/or more modern rabbi to assist and/or replace Widom? And also, all of these news articles seem fairly definitive, but why does he not appear in the shul‘s financial records?! And yet another rabbi from this period, also not in the list, was Rabbi Joseph Grossman. He shows up in newspaper articles in 1917-1918 — often, but not always, in connection with youth activities. 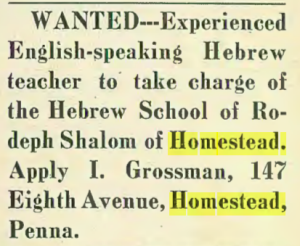 After he left Homestead, he never had a rabbinic post again, and a member of his family never even had heard that he had been a rabbi, so hmm. I haven’t yet cross-referenced the synagogue’s financial records for Kahn or Grossman to get a more specific sense of when either was there. A couple factors seem to be at play with the hiring of both of these men (and Winkler, below) to augment Widom. The first is that there was a general urgency at that time to find English-speaking rabbis to keep Jews engaged. In Homestead, by this period a substantial portion of the younger members were American-born with difficult cultural expectations from their parents and grandparents. The second is that numbers-wise, the late teens and twenties may have been the peak period for the number of children in the community. At any rate, after 1922, the synagogue never had multiple rabbis at once. An accomplished rabbi from Hungary, it seems the congregation made it possible for him to immigrate and learn English on the job. He left early in his second year for a more prominent position in LA. His entire term overlapped with Rev. Widom’s, which caused problems. Left out of this list entirely was Rev. Benjamin N. Goldberg, who served from January 1925-September 1927. He caused them no end of trouble both during his time there and after his departure, so it’s no wonder they edited him out of their history! He was hired at the end of 1927 after Goldberg left (not in 1925, as the list says). His contract was renewed at the end of 1930. 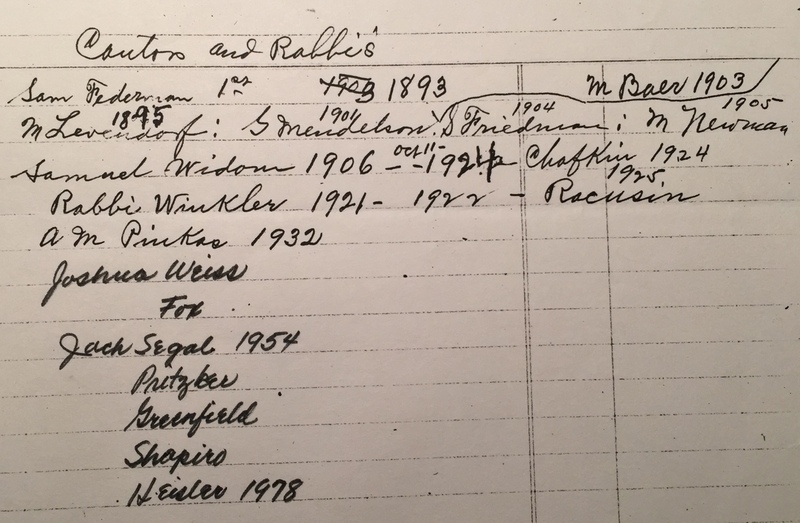 Though his contract ran through the end of 1931, he was last paid on 8/2/1931, and a new rabbi was hired 8/17/1931. There is no mention in the minutes even of his departure. Rabbi Pinkas was born in Poland in 1906. At some point he made aliyah. He left Israel and arrived in NYC 1929, already by then a rabbi. Previously from Kittanning, he arrived at Homestead 9/6/1931 in time for Selichot services. The following year he married a Pittsburgh girl, Ruth. In 1942 he applied to become a chaplain in the army, though it appears he was not accepted. He was terminated in 1944 when he asked for a period of absence. He spent the rest of his career as assistant rabbi at Taylor Road Synagogue in Cleveland Heights, dying of a cerebral hemorrhage in 1960. Originally from Pittsburgh. He had to break his contract because his wife was sick and needed a change of climate. 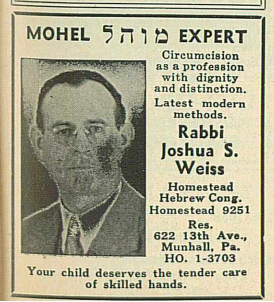 Advertisement for Rabbi Weiss in the Jewish Criterion c. 1950. Rabbi Weiss had been passed over for Rabbi Fox earlier in the year. “It seems that it was not destined for me to become your spiritual leader,” he wrote to the shul in May. “Kol mah d’avid rachamana l’tav avid.” (“All that the Merciful One does, He does for good.”) 2 But after Rabbi Fox had to resign, Rabbi Weiss got his chance after all. “Rabbi Weiss is well known around Pittsburgh,” wrote the Jewish Criterion on 1/12/1945. “Before going to Lancaster he was rabbi at the Ohav Zedek Congregation in East Pittsburgh for eight years and prior to that of the Bethel Congregation in Beechview where he helped organize and build the first synagogue in the South Hills area. “He was born in Czechoslovakia and was educated at the Satmar Rabbincal Seminary, under the leadership of Rabbi D.L. Greenwald, and the University of Pittsburgh.” Prior to Homestead he had spent seven and a half years at Congregation Degel Israel of Lancaster. After leaving Homestead, he stayed in the Pittsburgh area, moving onto B’nai Emunoh and retaining his connection to the Homestead community. He even proposed to merge his new congregation with theirs in 1967! Read more about him from the Rauh Jewish Archives. A newly-ordained, twenty-five year old rabbi when he arrived in Homestead, he was very popular in the community and many Homesteaders are still in touch with him even today! Prior to his rabbinic studied, Rabbi Segal had majored in Physics and minored in Mathematics at NYU and did three years of graduate work in Physics at Columbia. He continued his physics studies at Pitt while he was in Homestead. 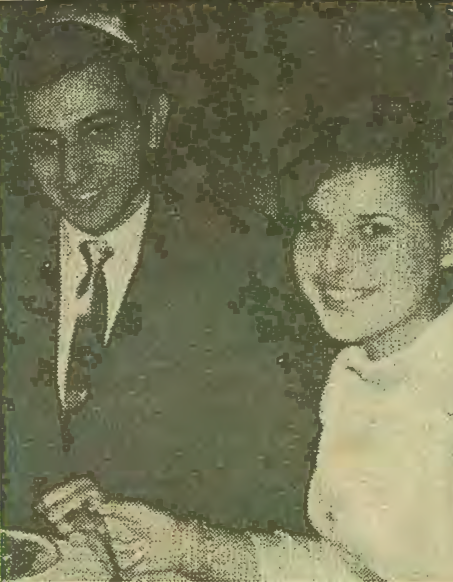 His next pulpit was at Tree of Life in McKeesport, where in September 1957 he got engaged to a local girl! After the November wedding they moved to Portland. More about the rabbi from his current synagogue here. He also wrote a couple books. 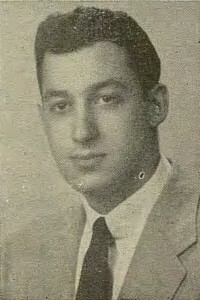 A native of New Haven, he graduated from Yeshiva College and was ordained into the rabbinate by its Rabbi Isaac Elchanan Theological Seminary in 1956. Like Rabbi Segal, he had done other graduate work, in his case in economics and accounting at the City College of New York, and while at Homestead earned his Masters in Education from Pitt. He resigned in August 1958 to become rabbi at the Briarwood Jewish Center in Briarwood, Long Island. A native of Newark, he graduated from of Yeshiva University and its Theological Seminary. 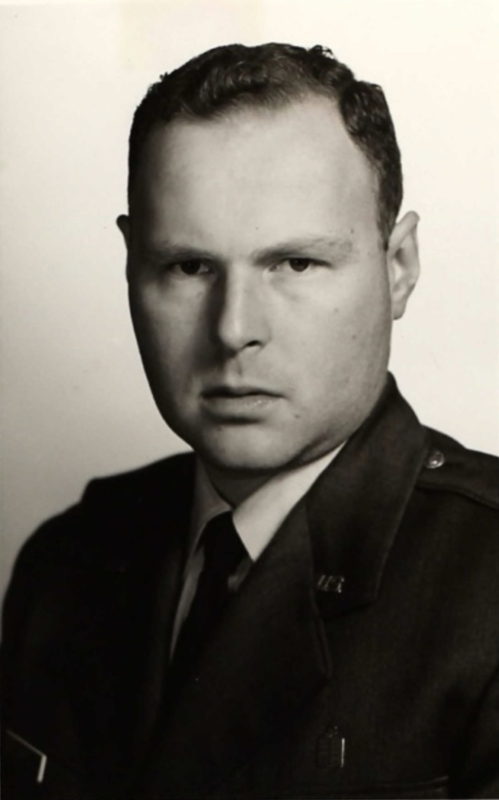 Prior to starting at Homestead he completed two years as chaplain with the United States Strategic Air Command. Also a college and rabbinical school graduate of YU, he had previously been the rabbi at Agudath Achim Congregation in Aliquippa for ten years. A bit older than the previous rabbis, he was the father of three. 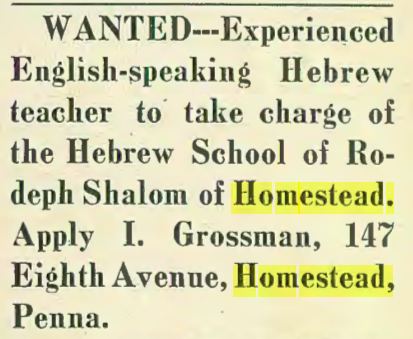 During the time he served Homestead, he also taught Talmud at Hillel Academy in Pittsburgh. He left to move to Ottawa, leaving congregational work for school administration. A native New Yorker, he received his s’micha from Telshe Yeshiva. He also had a degree in psychology from Brooklyn College and did graduate work at Lehigh. 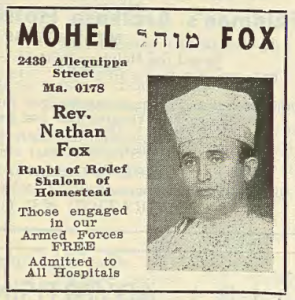 The rabbi and his wife came to Homestead from Reading with their eight year-old son, Stephen. As they had previously, they both taught in Pittsburgh at Hillel Academy. Before leaving the area, he recommended Deutch to the congregation as his successor. Rabbi Hershel Deutsch grew up in Squirrel Hill, where his parents lived at the time he was Homestead’s rabbi. He attended Yeshiva and Hillel Academy (through which, I suspect, Rabbi Moskowitz got to know him) and received his rabbinical ordination at Yeshiva Ner Israel in Baltimore with a master’s degree in Educational Administration from Loyola College in Baltimore. You refer to Samuel J. FEATHERMAN as Sam FEDERMAN. I am researching Rev. Samuel FEDERMAN of McKeesport, PA (1900-1920) and wonder if you mean him. One indication not is you have arrival as 1888 whereas Samuel of McKeesport immigrated in 1874/1870 per US Censuses 1900/1910. His first wife was Bertha LEFKOWITZ and second wife named Dora. I’d like to find out more about Dora. Hmmm.. I’m inclined say the odds are low that they are two different people… and neither of the sources that we have the immigration year from are particularly reliable as these things go. The only other information I’ve found on the Homestead Rev. Federman are these two newspaper articles mentioning his daughter’s name as Bertha, which makes it less likely that his wife was also Bertha… unless the first wife died in childbirth having her? Note that the daughter and her husband were in McKeesport, which increases the possibility that Rev. Federman went there after Homestead? McK had a much larger Jewish community, with a large Hungarian contingent, which would have made him attractive to them and vice versa. Altho… if I’m looking at the same census you are, it seems like he was retired in McK, which would perhaps bolster the case why he went to the neighboring town where his daughter already was. Does the daughter’s name help you piece this together? Knowing Bertha’s name is strong confirmation the two Rabbi Samuel FEDERMAN’s are one and the same. I can demonstrate that Samuel I. and Bertha (Lefkowitz) FEDERMAN had a daughter Bertha born about 1874 who married Harry Joseph MOSKOWITZ between April 1894 to March 1895. Bertha the daughter with H. J. and family lived in McKeesport for many years (at least until 1920). Bertha the mother died in 1908 and her death certificate said she was the daughter of M. J. and Bertha LEFKOWITZ. Other of her S. I. and Bertha FEDERMAN’s children listed her maiden name as LEFKOWITZ. I’ve identified four sons of hers and there may have been more. I have identified one daughter for sure and there is potentially another named Feiga. I am still in search of Dora who Samuel I. married in 1908 and her son Emil/Edward who was born about 1899. I know these dates by the 1910 census but have not found the documentation of the marriage. I can provide more information about him and his family. I have proven that Dora FUERMAN married Samuel FEDERMAN ca August 1908 (published notice of marriage license in the Pittsburgh Post-Gazette). I have been able to trace her son until his death in 1973 but still have two big gaps 1919-1938 and 1949-1973 (except his death).